Five pain management physicians discuss what legislators can do regarding current healthcare legislation to positively impact pain management. Laxmaiah Manchikanti, MD, Pain Management Center of Paducah (Paducah, Ky.): To positively impact pain management, which will also impact all of medicine, the most important issue is to remove the restriction of single-dose vials for one patient, which really does not control infections but only increases costs, reduces quality of care and reduces access. This is another issue which can make or break interventional pain management. Of course, other issues are related to indefinitely postponing ICD-10 and also lifting all restrictions on electronic health records. The final issue is related to the 27.4 percent cut with the Medicare Sustainable Growth Rate; however, it appears that they may be reaching a deal on this issue. Lora L. Brown, MD, Coastal Pain and Rehabilitation (Bradenton, Fla.): Legislators need to secure funding for pain procedures during the healthcare reform process. Millions of people suffer from chronic pain and many of them are inappropriately treated with opioid medications. This is an unfortunate consequence of lack of access to good interventional pain management treatment, which can many times provide relief from chronic pain. Frank J. E. Falco, MD, Mid Atlantic Spine (Bear, Del. ): Fix the Medicare Sustainable Growth Rate or scrap the SGR and create a different formula to take into account cost of living and overhead expenses. Nix ICD-10-CM, which will cost $60,000 per physician to implement. Reduce EMR costs by eliminating unnecessary requirements. Funding for NASPER, National All Schedules Prescription Electronic Reporting Act, was signed into law on Aug. 12, 2005, [and was] introduced by and petitioned to the U.S. Congress by Laxmaiah Manchikanti, MD, and ASIPP members. NASPER has not been consistently funded by the U.S. Congress. This HIPAA compliant law, if consistently funded on an annual basis, would significantly prevent doctor shopping and drug diversion by allowing physicians and pharmacists to access patient records showing what prescribed controlled drugs have been prescribed and dispensed to a patient anywhere throughout the United States. Gennady Gekht, MD, Coastal Pain and Rehabilitation (Bradenton, Fla.): Prescription pain medications must be administered only by specialists with proper credentials. Those physicians who operate clinics [where] the sole purpose is for-profit narcotic analgesic dispensation must be eliminated. The big problem in Florida is that there is a proliferation of for-profit pain clinics. Unfortunately, these pain clinics are indeed not pain clinics, but pill mills where the primary goal is dispensation of narcotic analgesics for profit. These pill mills have created significant barriers for patients getting proper care. These pill mills have created an industry of out-of-towners coming in and receiving these meds and selling them on the street. The Florida legislature in part has a lot of work to do still to implement stronger controls of these pill mills. There have been several steps already taken, such as drug monitoring programs. However, the laws need to be strengthened, maybe to become more punitive toward the physicians who run these clinics. Monitoring programs need to be put in place and must be funded to control these clinics. 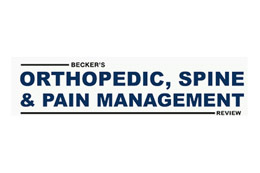 David Kloth, MD, Connecticut Pain Care (Danbury, Conn.): Mandate that interventional pain management is the practice of medicine and that you must be a properly trained physician to perform these procedures. This is a field in desperate need of some level of credential requirement. The level of care is all over the spectrum and it is severely hurting the reputation of our specialty.